Cute anime girls on stage singing and dancing... S’okay, but I feel I should be more entertained than I actually am. The iDOLM@ASTER: Cinderella Girls is the spiritual successor to The iDOLM@STER anime. Where The iDOLM@STER was based on the Xbox 360/PS3 game, Cinderella Girls is based on the smartphone spin-off. While both shows supposedly share the same world, aside from the title there is very little to indicate that this is the case. Cinderella Girls is very much its own separate story. While the base theme of “girls with aspirations to become idols working towards the goal” is the same, everything else from the characters to the location to the production company are entirely different, nevertheless because both shows share the same stupid spelling for “idolmaster” and font for their logos, it is almost impossible not to draw comparisons between the two – and this is where Cinderella Girls fails to live up to expectations. First off, in Cinderella Girls, the main objective of striving for success is lessened by the fact the production company, 346 (Mishiro) Productions is already a well-established, and apparently quite successfully production company with its own training facilities for fledgling idols. The girls who are recruited to be idols as part of the overarching “Cinderella Project” are pretty much set on the path of success the moment they are selected. This seriously diminishes any major sense of struggle on the part of the girls. It’s hard to feel real empathy for them when any hurdles they have to overcome are pretty much reduced to personal, almost petty, grievances on an individual level with no major sense of consequence. They’re backed by a major powerhouse that will continue to profit regardless of their success. There’s nothing really on the line for the viewer to latch onto. The idols themselves are very cookie-cutter, and even after watching the series, I remembered maybe 3 out of the 14 girls’ names. Sadly, they’re just not all that memorable. They’re pretty much your standard archetypal characters. There’s the quiet one, the happy one, the lazy one, the cool one, the cutesy one, the weird one... They don’t really stray out of their standard comfort zones and throughout the 13 episodes, remain severely underdeveloped. This may be due to the fact that in the game the show is based on, the characters have little to no real story arcs to speak of, whereas with the original iDOLM@STER game, every girl had an arc and varying degrees of development. With Cinderella Girls, it almost felt like the creators had very little wiggle room for which to take some creative license, lest they risk alienating, or worse, incurring the wrath of said fans. But that’s mostly speculation on my part. There are 3 “main” girls who serve as the basis of entry into the series, but only one has much of anything that could be considered an “arc” throughout the series, and even that is pretty much completed by the end of episode 7. Even the later character-centric episodes only really serve to better introduce the characters rather than define or evolve them. In fact, of all the characters, the only one who could be seriously called a “protagonist” with an actual arc is the producer. The producer in Cinderella Girls is by far the deepest and most interesting character. From his initial entrance where the ground literally shakes at his footsteps, to the moments where he is taken away for questioning by the police multiple times for seemingly suspicious behavior, watching the producer is actually more entertaining than watching the girls in his care. Even when the previously mentioned arc of one of the main girls happens, it’s the producer’s side of the story that is far more captivating and engaging. Where in the original iDOLM@STER, the producer was nothing more than a cipher to serve as an avatar for the viewer/fan, in Cinderella Girls, the producer is an independent, and well-defined character in his own right which actually makes him steal the show whenever he’s on screen. 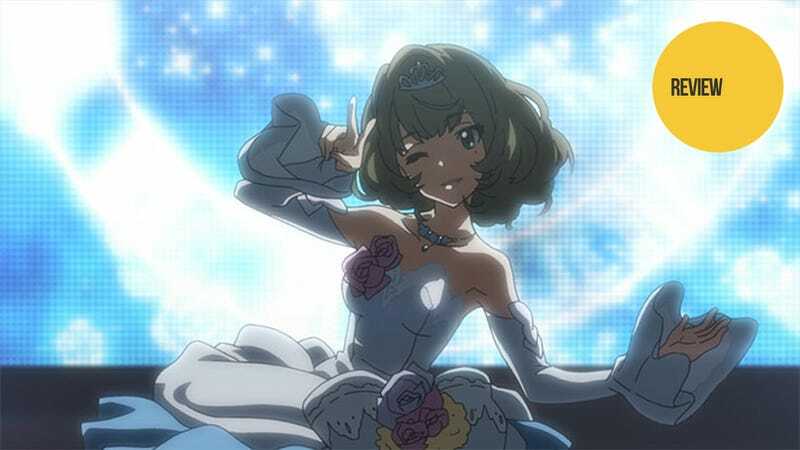 As a series about idols who sing and dance, the series is littered with musical cuts and scenes of stage performances. These are pretty enjoyable, but a little lacking in substance overall. This mostly stems from the weakness of the characters. While I liked the musical numbers and found them entertaining, at the end of the day, the only song that sticks in my head is the opening intro song, and that’s because I heard it at the beginning of almost every episode. On the whole, Cinderella Girls feels like an extended intro – 13 episodes spent setting thing up and ends just when things look like they’re about to get interesting. That said, it’s light-hearted and fun enough to make it worth a watch, even if it’s not overly memorable. It is worth noting that a second season is on the way, which will hopefully flesh out the characters and complement this first season.